Welcome to Youth Empowerment in Action! YEA! TEAM will soon be recruiting schools for 2009-2010. YEA! 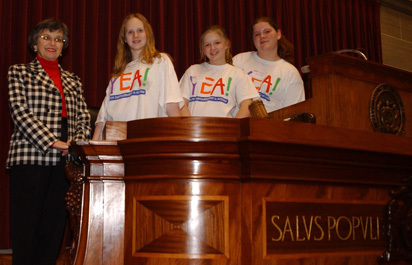 TEAM's anti-tobacco policy work sweeps the 2009 Project Citizen Showcase in Jefferson City and goes on to compete at the nationals. The Youth Empowerment in Action! (YEA!) program promotes healthy youth and school communities through an intedisciplinary academic curriculum that incorporates the development of media literacy and civic engagement skills. These are the skills students need to successfully navigate the 21st century. YEA! is a research-based service-learning program fully aligned to the Missouri Show-Me Standards and Grade Level Expectations. It was developed by the Center for Character & Citizenship in the College of Education, at the University of Missouri - St. Louis, with funding from the Missouri Foundation for Health and other private philanthropies. YEA! is implemented in schools with funding from the Missouri Department of Health and Senior Services. Schools receive teacher training, curriculum materials, media production services, and community outreach resources at no cost to the school. With continued support from our state legislators, YEA!’s goals of empowering youth to develop critical thinking skills, establish healthy habits, and lead positive change in their communities are becoming a reality! See how YEA! 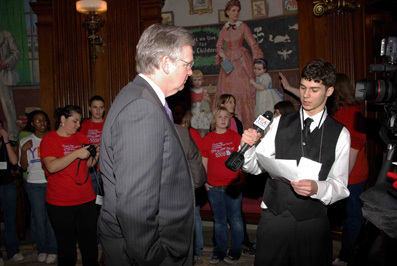 students are engaging their legislators, creating media campaigns, and mobilizing their generation at the 2009 Youth Summit and the Project Citizen Showcase in Jefferson City! YEA! extends a special thank you to Thomas Gorman Inc. for outfitting the new YEA! office with lovely furniture. Scott County Wins Missouri's Project Citizen Showcase!